KINGSTON, R.I. — Recent reports that lobster shell disease has turned up along the coast of Maine have Kathy Castro worried. The University of Rhode Island fisheries scientist has led a 15-year international effort to understand what causes the disease that has, until recently, been confined primarily to the waters of southern New England and Long Island Sound. If it expands as rapidly in Maine as it did in Rhode Island waters, it could have a dramatic effect on the iconic Maine fishery, according to Castro. Castro was the first to notice the disease in 1996, and by 1998 nearly 18 percent of lobsters in Rhode Island waters were infected. With a $3 million federal appropriation secured in 2005, Castro assembled a team of geneticists, behaviorists, microbiologists, chemists and others from 15 research institutions to conduct 14 different research projects designed to learn as much as they could about the disease. “Most of us thought it was going to be related to warming waters or to the oil spill in 1996, but that doesn’t seem to be the case because of the complexity of the environment and the animals themselves,” Castro said. At the annual Rhode Island Sea Grant Baird Symposium at URI in 2010, all of the scientists came together to share their results with the public. What they found was alarming and confusing. According to the researchers, a bacterium that is new to local waters is believed to be the culprit responsible for allowing the disease to get started. 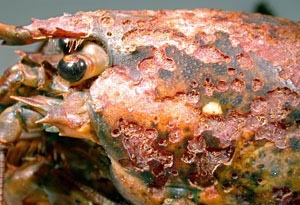 All lobsters have some bacteria on their shell, but those with shell disease have more of them. Concentrations of trace metals are higher in lobsters with shell disease, and alkyphenols, manmade chemicals, are often found in diseased lobsters, lengthening the time it takes for their shells to harden. Lobsters with shell disease also have a compromised immune system, and the disease may be a response to any number of stresses in their environment, including diet and temperature. In one study, 50 percent of the shell-diseased lobsters were found to be functionally blind, and another found degeneration of their livers, making it difficult for them to process food. Yet these studies found no correlation to shell disease. Castro believes that there must be a number of factors that, together, have created the conditions that have led to lobster shell disease. The good news, according to Castro, is that lobsters with shell disease can still be eaten without any adverse effects to consumers, since only the shell is diseased. And the lobster population in Rhode Island waters is at levels seen in the 1970s, before the unexplained increase in abundance that occurred in the late 1980s and ‘90s. But Castro remains determined to solve the mystery. The big question, she said, is what do all these diseases mean for the future of our coastal waters.